Military hero and beloved Dancing with the Stars alum Noah Galloway shares his life story, and how losing his arm and leg in combat forced him to relearn how to live--and live to the fullest. 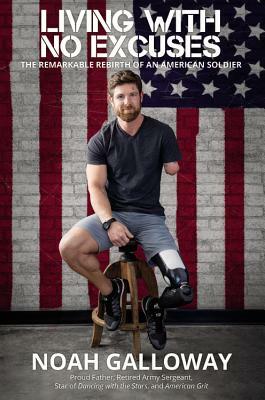 Inspirational, humorous, and thought provoking, Noah Galloway's LIVING WITH NO EXCUSES sheds light on his upbringing in rural Alabama, his military experience, and the battle he faced to overcome losing two limbs during Operation Iraqi Freedom. From reliving the early days of life to his acceptance of his "new normal" after losing his arm and leg in combat, Noah reveals his ambition to succeed against all odds. Noah's gripping story is a shining example that with laughter, and the right amount of perspective, you can tackle anything. Whether it be overcoming injury, conquering the Dancing with the Stars ballroom, or taking the next steps forward in life with his young family - Noah demonstrates how to live life to the fullest, with no excuses. Sergeant NOAH GALLOWAY was assigned to the 1st of the 502nd Infantry of the 101st Airborne Division during Operation Iraqi Freedom. Three months into his second tour of duty, he experienced a life changing injury-- losing his left arm above the elbow and left leg above the knee in an Improvised Explosive Device attack. After a long stint in recovery and rehabilitation, Noah became a motivational speaker and fitness activist. A father of three, Noah currently resides in Alabaster, Alabama.